Winner of Great Taste Award One Star Gold 2010. Slowly-roasted garlic and onions with balsamic vinegar blend to make a sublime condiment sure to become a pantry essential. A great glaze for warmed goat’s cheese. Fantastic as an addition to enhance the flavour of any sauce for meat. 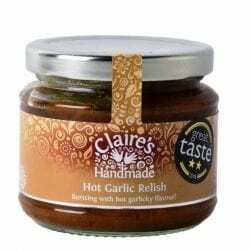 And, an exciting flavour boost added to gravies for wintery chicken, pork and lamb roasts. An easy idea for a canapé is mini bruschetta with goat’s cheese and topped with a little of this jam, warmed in the oven just a little. Prepared in premises where mustard, sulphites and gluten are used. 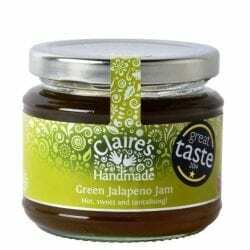 Delightfully hot and sticky Savoury Jam. Winner of Great Taste Award One Star Gold 2014. 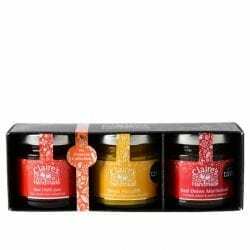 A tempting collection of our favourite savoury preserves. 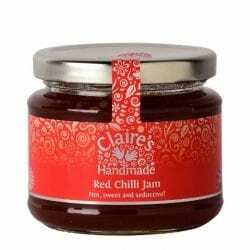 A flavoursome and aromatic relish made with ripe tomatoes, smoky Chipotle chillies and smoked paprika.